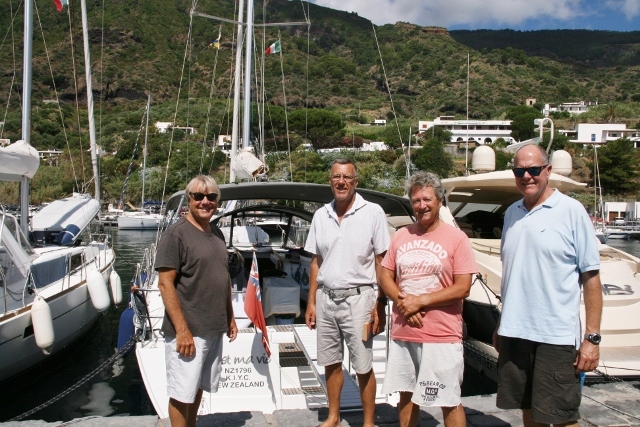 We arrived at Riposto after battling 30+ bullets of wind coming down from Mt Etna. We are sleep deprived, because for nights we have been joggled and jiggled in marinas or at anchor. There has been no respite. There hasn’t been much sleep either, so we were glad to get into Riposto which is very well protected and the promise of stillness made us smile. There was a 40 metre motor yacht, with a 5 piece jazz band playing Cole Porter and Sinatra on the upper deck. Sublime. Then suddenly the cacophony began. We realised it was a Feast day or a festival and initially the church bells rang ever so politely. 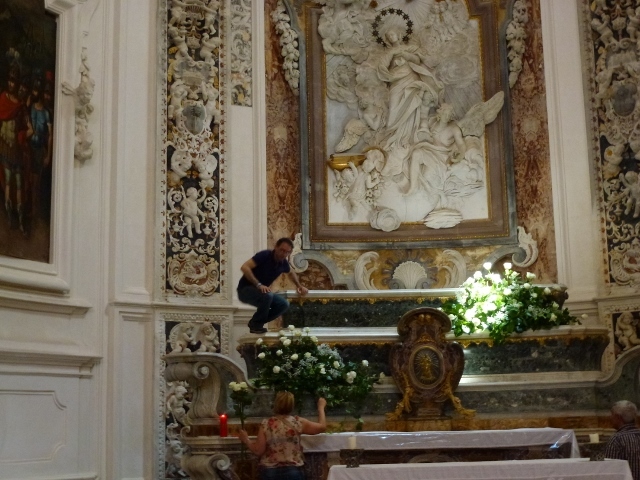 At first one church beginning and we sighed, smiling when they finished, one minute later the next church would begin, ending finally in dueling church bells Do you know how many churches are in even a small town like Riposto? Ah, but the bells weren’t the end of the noise; even in daytime, there were rounds of fireworks. Loud fireworks from Riposto pier in broad daylight with puffs of white smoke. Later, louder fireworks from nearby Giarre. Then more church bells, changing churches but going discordantly for about 20 minutes. Please note this was Saturday. They went into the night with the last splendid 60 minute fireworks display taken in by we two zombies. Pale faces and dark circles under our eyes, clapping feebly, wishing for the noise to stop. We collapsed into bed and slept so soundly until the church bells began ringing to wake us for matins, here at 6:15 am. We couldn’t spend a whole noisy Sunday here in Riposto, so we decided we would take the train to Taormina. We had missed Taormina because it was too windy to anchor in the bay yesterday. The train station is beautiful. Giardini-Taormina, a very 18th-19th century station, with beautiful columns and painted ceilings. We took the bus up the 2 km hairpin turn path. Breathtaking. What it is about hill top villages? 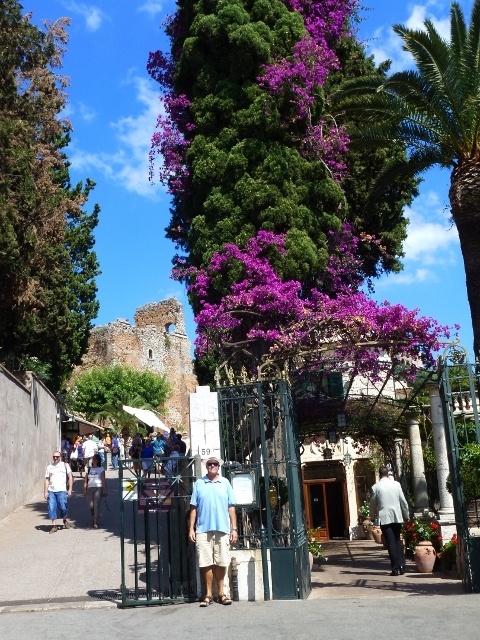 Especially hilltop villages that over look the sea, Taormina is beautiful and ancient. Shops abound up and down every alley. We peered into bakeries of beautiful marzipan, cannoli, almond biscuits and toffees. Gelaterias and cafes abound. We looked onto balconies planted with flowers and pots of majolica soldiers. 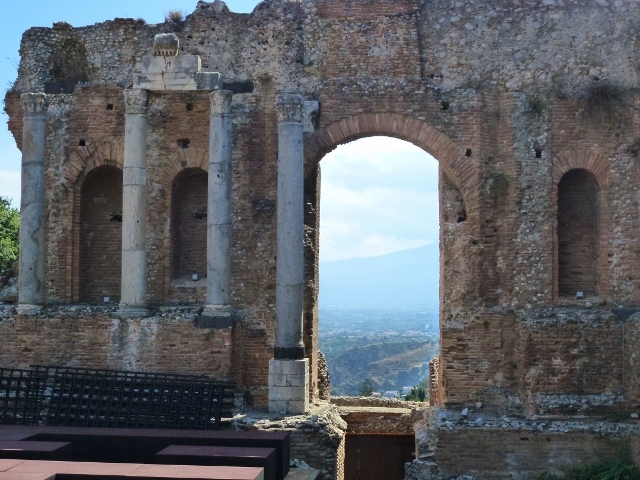 We ambled, looking at shops and found ourselves at the Teatro Greco. 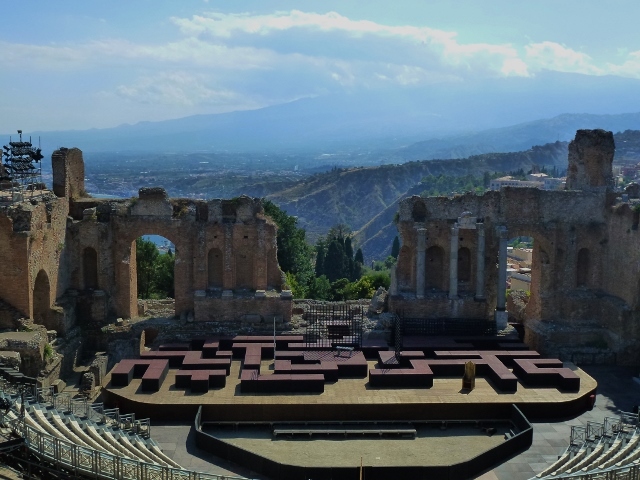 The Greeks, thousands of years ago, built a theatre in Taormina and the arches behind the stage looked out over Mount Etna. The Greeks were perhaps the original view junkies. I just keep looking at Etna, saying please don’t explode, I like you just the way you are. [For the two hours we having been working on this blog, the church bells have rung for about 35 minutes, simultaneously with wonderful fireworks and in the foreground the restaurant’s band singing the Beatles. Tonight, we aren’t so tired, we are enchanted. Posted on June 30, 2013 June 30, 2013 Categories Adventures, Travel, Volcanoes1 Comment on To sleep, perchance to dream. 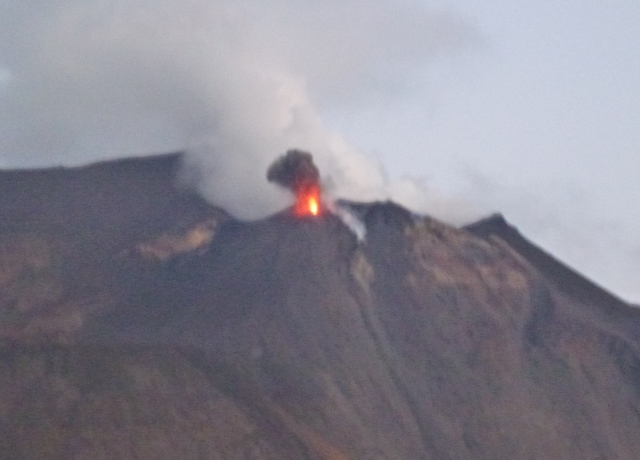 Yesterday, we spent a very quiet day at Vulcano, one of the two active volcanoes in the Aeolinan Islands. 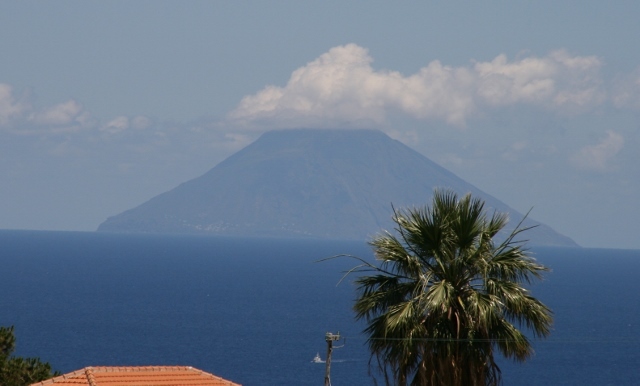 The smell of sulphur is redolent over the island and even out on the boats, it wafts out on a continuous cloud belched out by Vulcano. We had just anchored and we looked up and saw a water spout hanging from a increasingly dark cloud. We race for the cameras, hoping the water spout will keep going and pass us all by. The water spout does disappear, but we have a sudden intense squall. In thirty minutes, the rain moved away and just an hour later the beach was pink and golden in sunset. 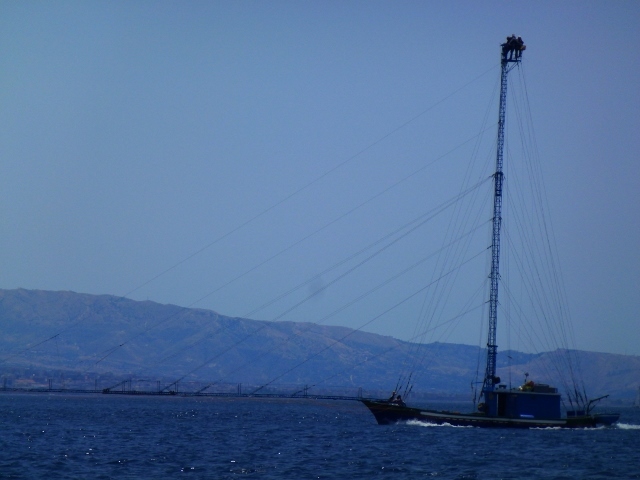 Today was a red letter day, we were up early to be on our way to catch the right current to take us through the Messina Straits. Here is where Odysseus had to worry about Scilla and Charybdis. 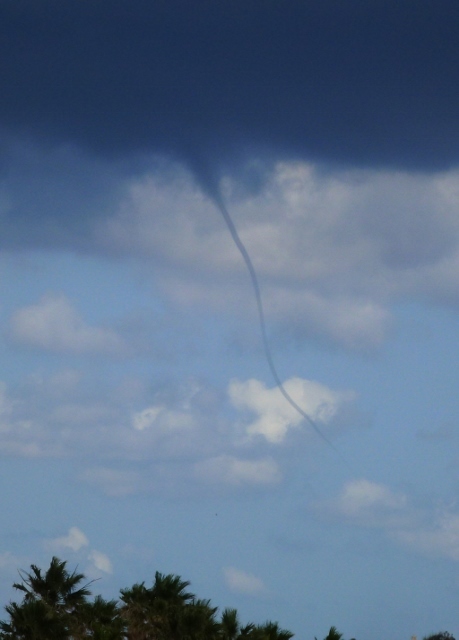 Water spouts are common and one book wondered if it was a waterspout that carried off six men. 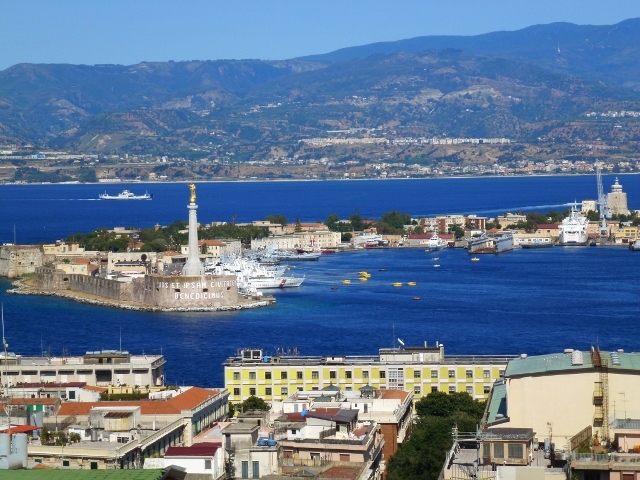 There are whirlpools at several places along the straits, not as strong now as in antiquity but I wouldn’t like to be caught in a squall in this narrow funnel between the Ionian Sea and the Tyrrhenian Sea. The current is visible in the Straits and going against it is very hard work. The Swordfish boats are quite unique and there were several trying to sneak up on sleeping sword fish as we were coming through the Straits. 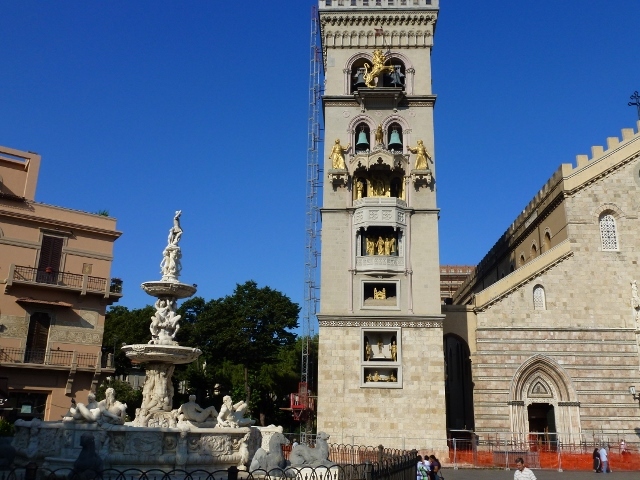 We had a look at Messina this afternoon, the Duomo’s Bell Tower is fascinating. 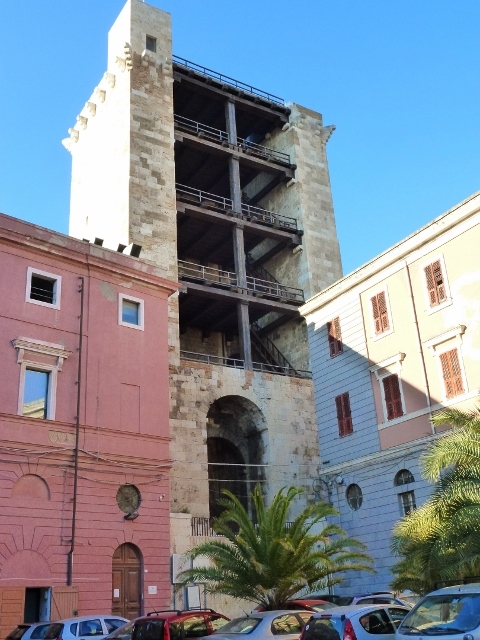 Messina itself is very new, compared to Italy in general, first it was flattened in a earthquake and then heavily bombed in WWll, some beautiful old buildings are still standing. 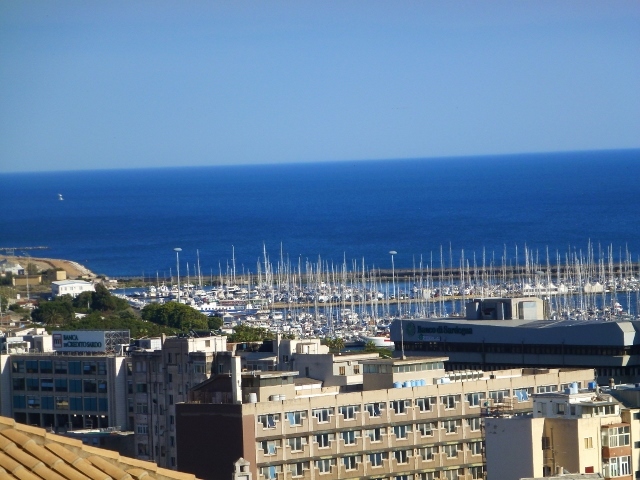 As sometimes happens, we chose to stay in a marina which is at the far reaches of town. Usually, as is the case here in Aquasanta, you just jump on a bus and go into town with the locals. 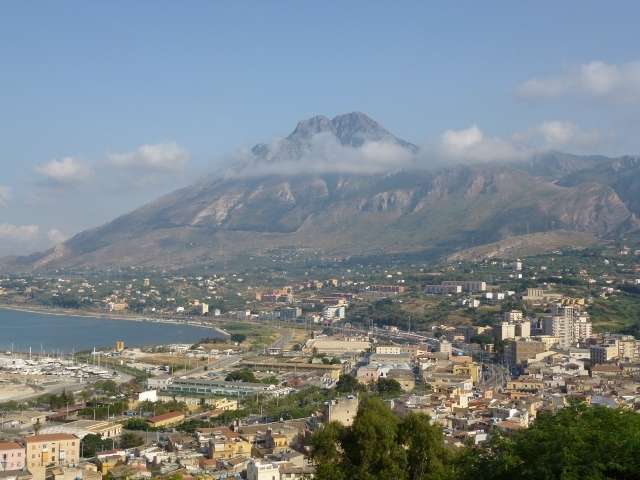 Greater Palermo is a city of around a million and it is noisy, dirty, bustling and energetic. Palermo is a synonym of chaos, but a very likeable chaos. We asked the bus driver if the bus would take us to Palermo ‘Centro’ and he waved us on the bus. We ride into town, not quite knowing where we were on the map, but then the driver calls Centro and we get off the bus. We turn left and a horn blares, it is our very sweet bus driver telling us to go the other way and then turn again. We find ourselves quickly on the main street in town. Palermo is friendly. We find so many shops, especially shoe shops. On a street adjacent to a big church, you will find a whole street of baby shops for all the wee babes being baptised and one funeral parlour. 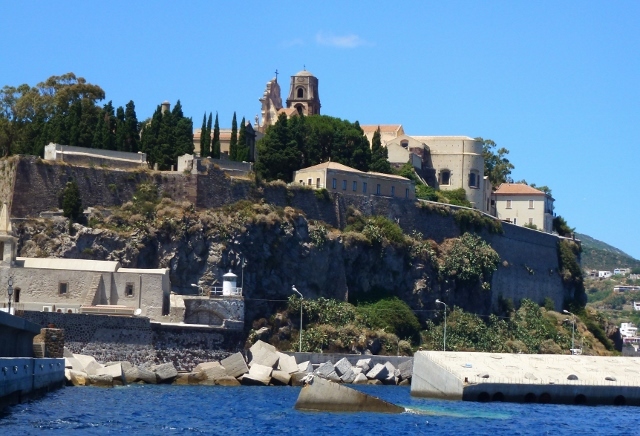 Sicily seems to have been conquered by every nation, but it was always the outpost. That usually meant these nations and emperors took the people’s wealth home with them and left the people in poverty. 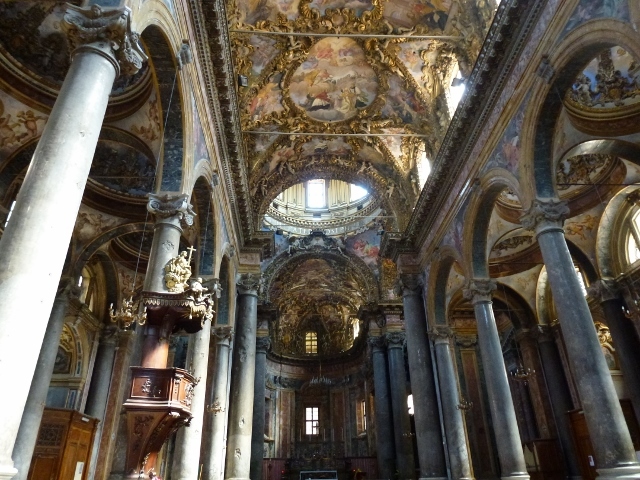 The Catholic Church was seemingly the only exception, Palermo like most Italian towns has a large number of churches, many old and ornate. 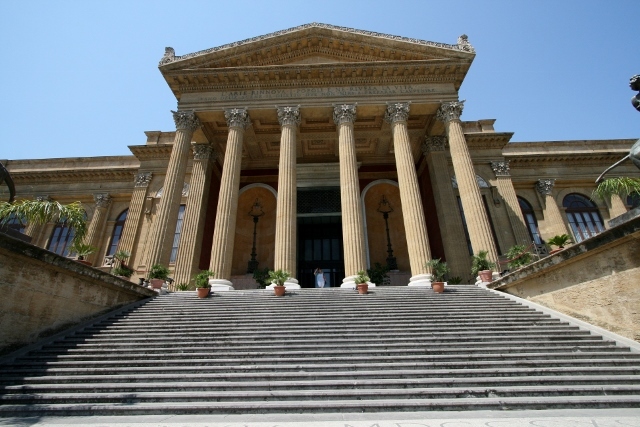 Most of the landmark buildings in Palermo are gorgeous and ostentatious churches. They have chandeliers hanging from the ceilings and they are ornate and gilt. The museum is mainly full of religious art, of churches damaged over the ages or in the bombing of WWll. There are a few older stone sculptures but it would seem 90% of the art is religious. There is a high street or fashion centre in Palermo, all the fashion houses are on a main boulevard and there are so many shoe shops at Sydney prices. There are plenty of restaurants from street food to trattoria and restaurants. 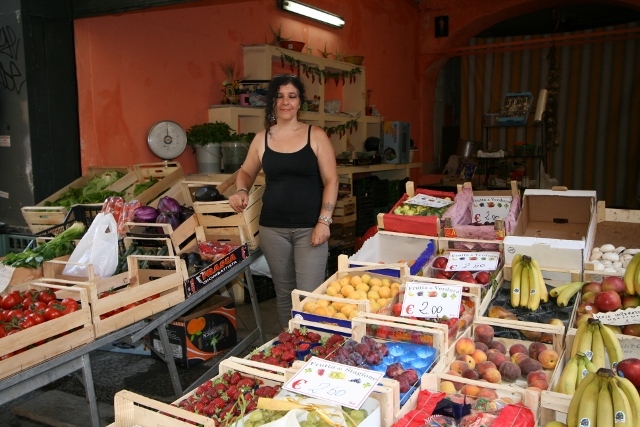 Almost strangely, we had to track down a gelateria, we only saw a few, but we did see fish sellers and Signora Fruit and Vegetable was happy to pose for a picture. Now onto to Termini Imerese, what will we find there? 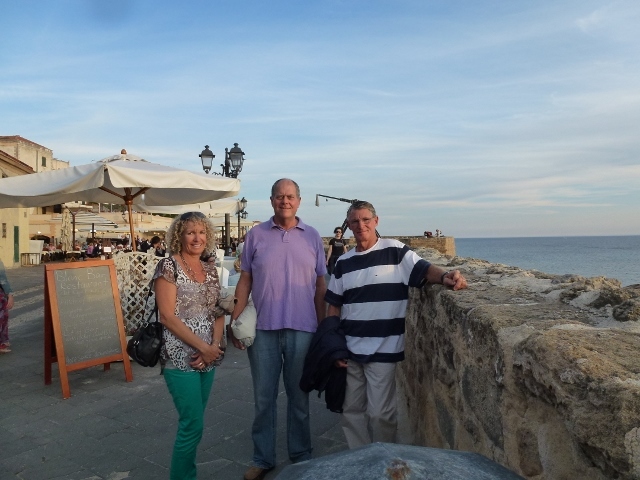 We took a 40 minute bus ride to Trapani, a busy port we sailed by on Monday. 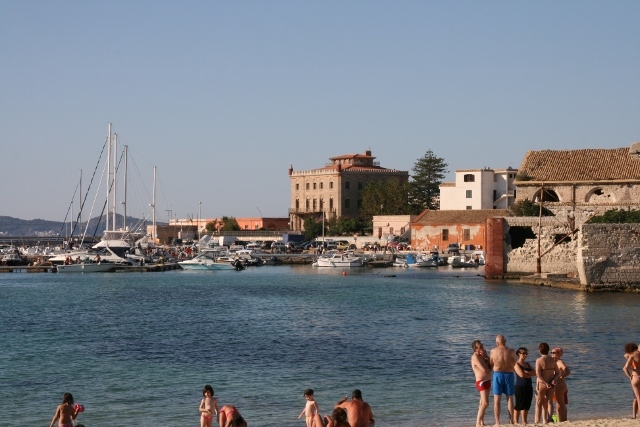 As it is a commercial port, they have many additional rules to follow and the port isn’t as clean as San Vito lo Capo. 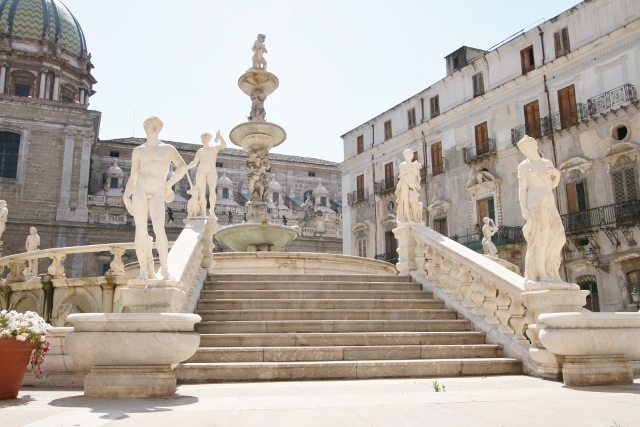 Trapani has a beautiful old Centro historico and a lovely park. 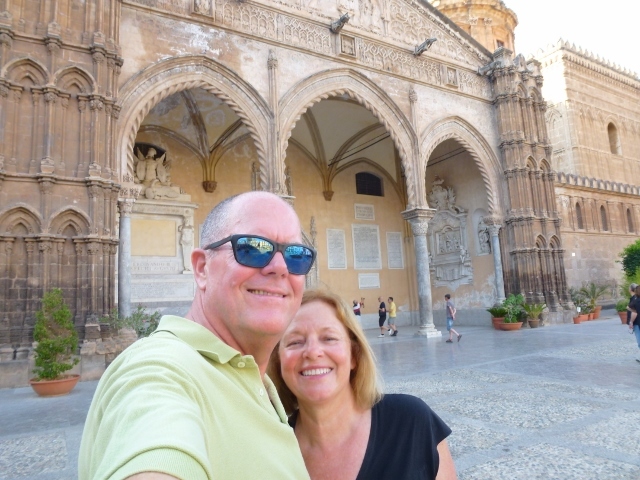 It is a very big town, but we went down to the port and old town and wandered around looking at the almost patchwork of different architectural styles, as Trapani has evolved over the centuries. Each church isn’t only influenced by the order of priests but of the time it was built. We also enjoyed the green space of Villa Margharita, with old giant figs and geese and other birds in enclosures. It was a cool place to be in the midday heat and there were quite a few tourists there, because other than a few restaurants, everything closes for several hours at lunch. 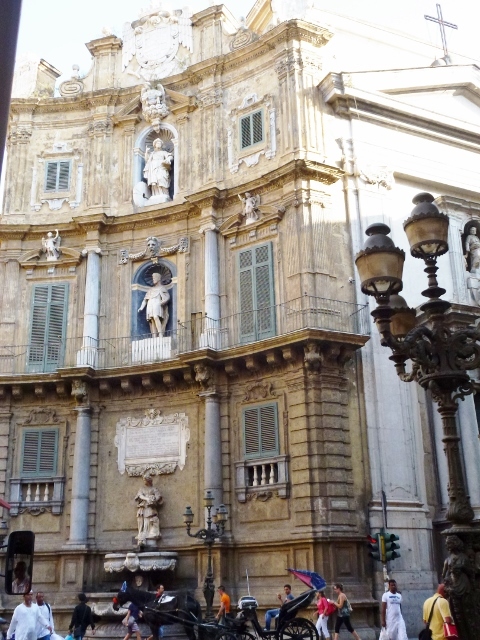 Some of the buildings in the Corso Victor Emmanuel and the Palazzo Cavarretta are so Rococo giving the impression they are made of nougat and meringue. 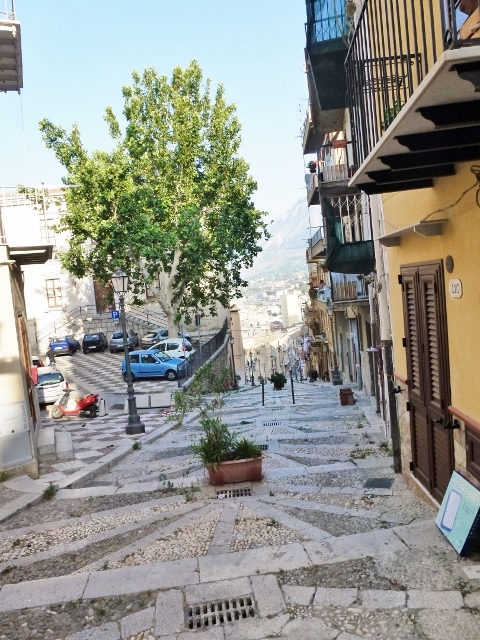 In the afternoon, we were on the old wall over looking the sea, which in the mornings holds a market and discovered a Gelateria who had beautiful ices and gelato, but also pastries. The cannoli shells were there above the gelato and you could have your shelf stuffed with ricotta ice cream or the traditional ricotta mixture. We sat outside on ottomans and enjoyed the ambience. Back in San Vito lo Capo, we walked along the foreshore and then along the beach. We had read quite a bit about the September Couscous festival and decided to go to a couscouseria for dinner. We both ordered different flavours of couscous. They first create the broth to go with your meal, mine was a broth of citrus and tuna; James had a tomato based broth with mixed seafood. But each of our couscous was a match to our broth. James’ couscous had a tomato colour with prawns, shrimp and fish. My couscous was a brownish hue with almonds, citrus and eggplant. You then spoon the broth from your individual bowl onto your mound of couscous. It was very tasty and quite a different presentation. Not the generic couscous that we have prepared with meals,not the much plainer alternative. 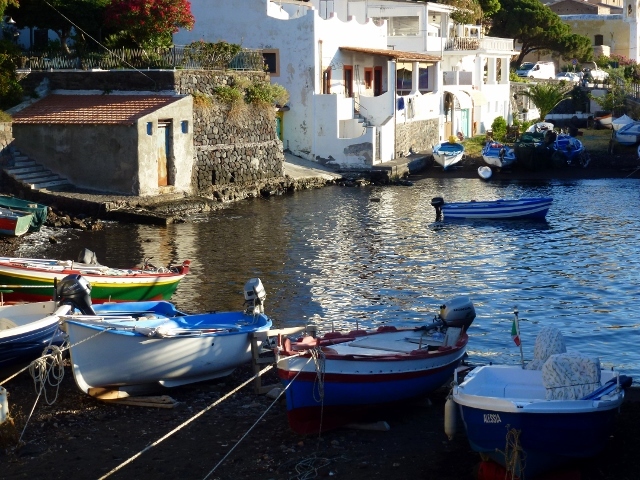 This morning we sailed off in a wonderful procession of boats to Zingaro, water temperature of 24 degrees, so we anchored and swam with half a dozen other boats. 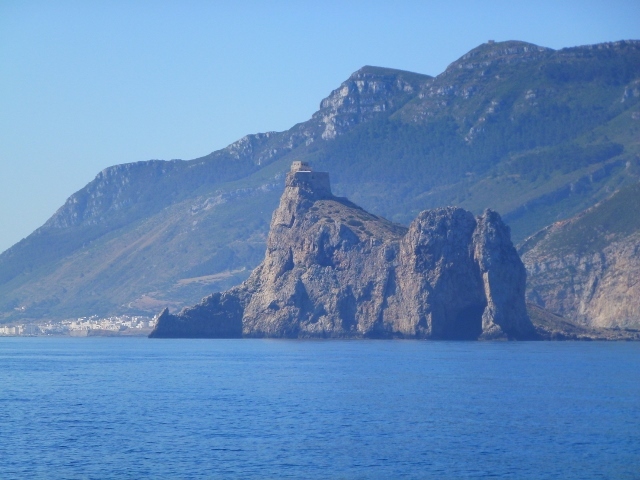 Then we continued on to the feudal village of Scopello, with it’s craggy rocks off the town, one with an ancient fortification perched atop of it. 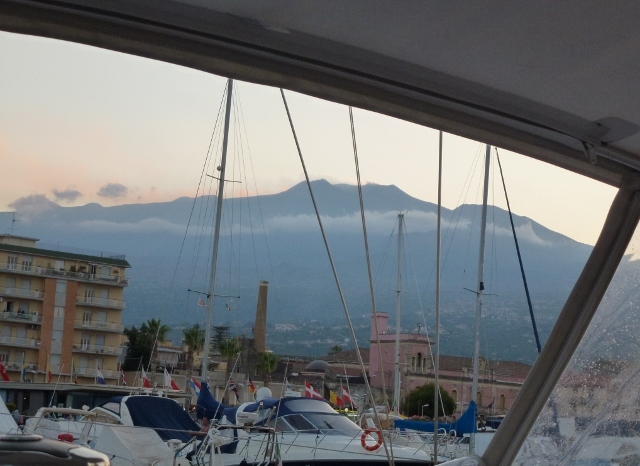 Finally we reached Castellammare del Golfo, we wandered up to the old Castle and looked back to the boats in the harbour. It was siesta, it’s taken very seriously here. 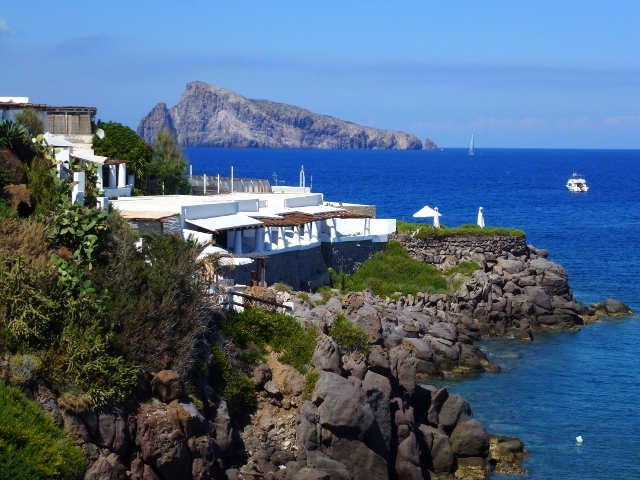 The first thing we noticed about Favignana, an island 7 kilometres off the coast of Trapani, is the crystal clear water. We look at the plotter, which tells us we are in nine metres of water and we can see the bottom. The clarity is beautiful. We are in Italy’s largest marine reserve. 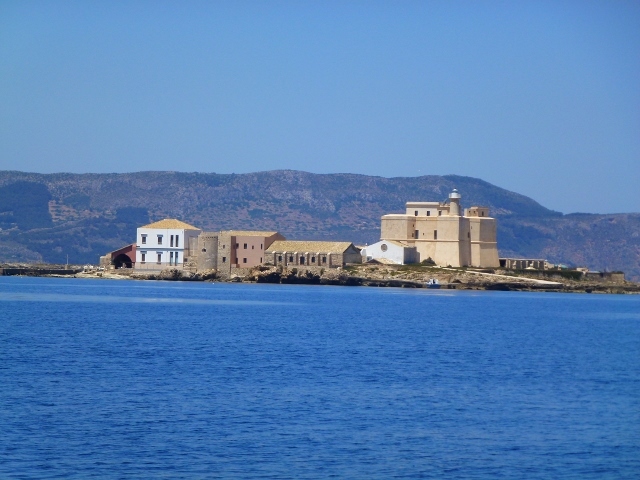 Many of you will say that you have never heard of Favignana, but if you read Homer’s Odyssey, in a bid to extract yourself from high school, you will know it as Goat Island. This island was the last stop before the Cyclop’s island and was full of goats, which fed the big O’s crew for awhile. 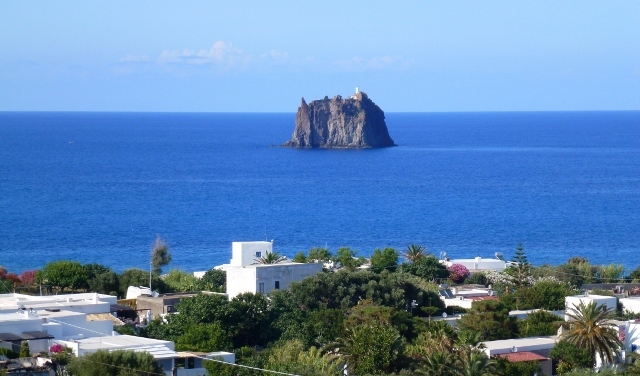 From the 15th Century, the island was famous for it’s tuna catches and fishermen. 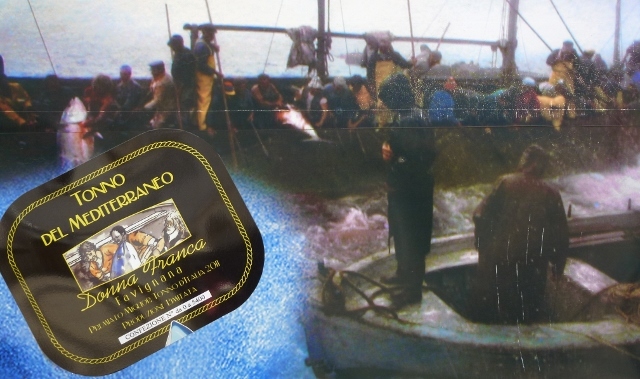 In the 19th Century, a wealthy industrialist, Florio built a major tuna cannery on the island, bringing prosperity to the small island and its inhabitants. 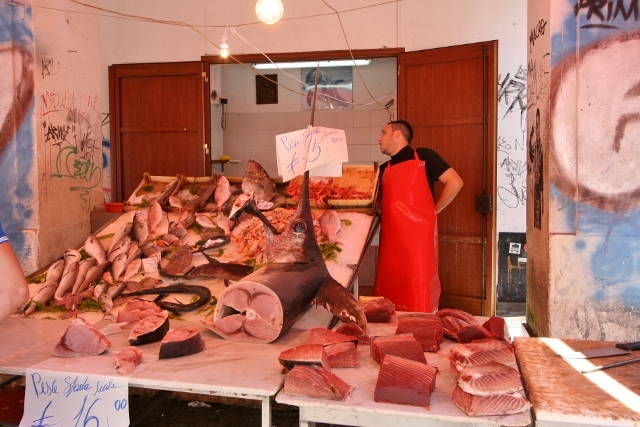 The Arabs were here in the early Middle Ages and they brought the ancient fishing technique called Mattanza, trapping scores of bluefish tuna. They seemed to be on very long flat boats and they had enormous anchors to hold them fast. When they switched to long line boats, many of these anchors came onto the beach – a veritable anchor’s graveyard. Behemoth anchors rusting in silvered wood on the beach near the marina. We were here on a Sunday, so we weren’t surprised at the number of people riding bikes, scooters and eating gelato even before passeggiata. Just before sunset, a ferry came in and engorged a large number of tourists, back to Trapani, home and work on Monday. 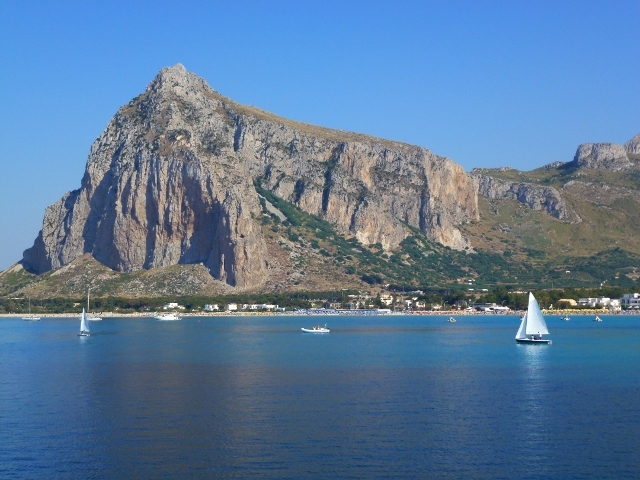 Monday found us on our way to San Vito lo Capo on the Costa Gaia, one of Italy’s most beautiful beaches. 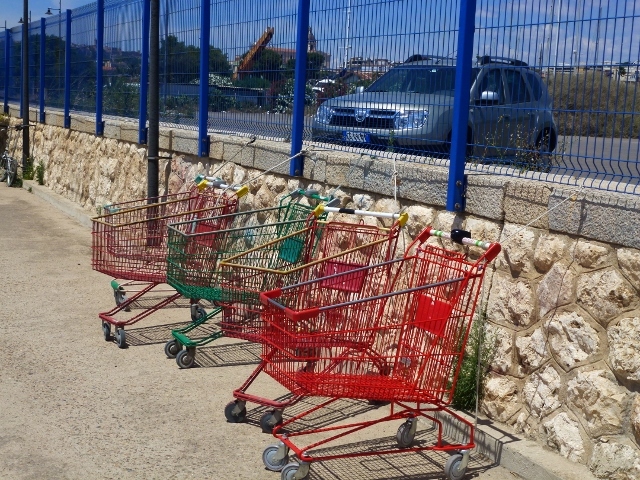 San Vito explodes with colour as you approach the beach before turning into the marina. Brightly coloured umbrellas, beach towels and cossies across the light sand beach animate this patch of Sicily’s coast. 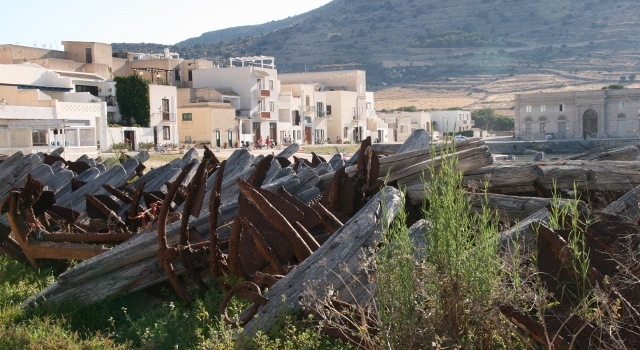 Unlike most of the ancient ports we visit, San Vito lo Capo seems to have been developed in the early 1950’s. The main street reminds me of Coney Island without the rides, lots of lights, souvenir stores and Havianna stores up and down the street. We will explore a bit more today. 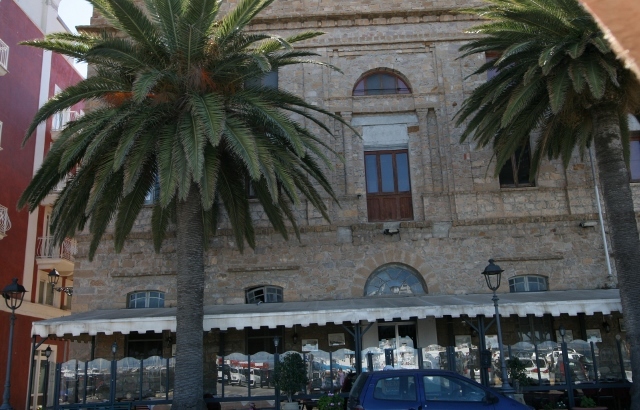 Cagliari is Sardinia’s capital as well as it’s largest city. As a town it is very large and spread out, so we only saw some of the sights. 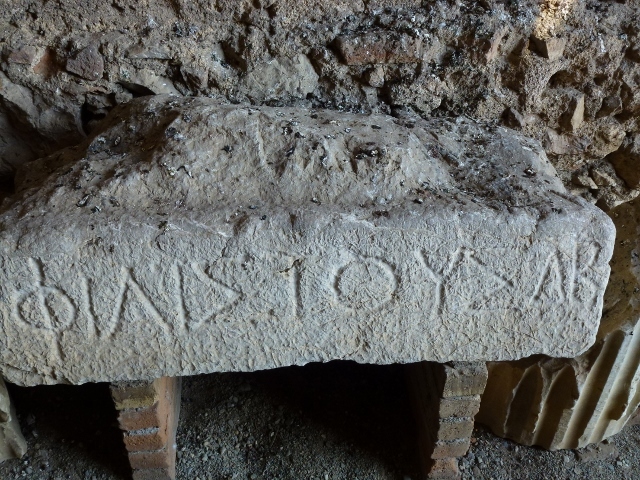 Cagliari’s history, starts with the Neolithic period and like all of Italy has had many rulers throughout the ages. 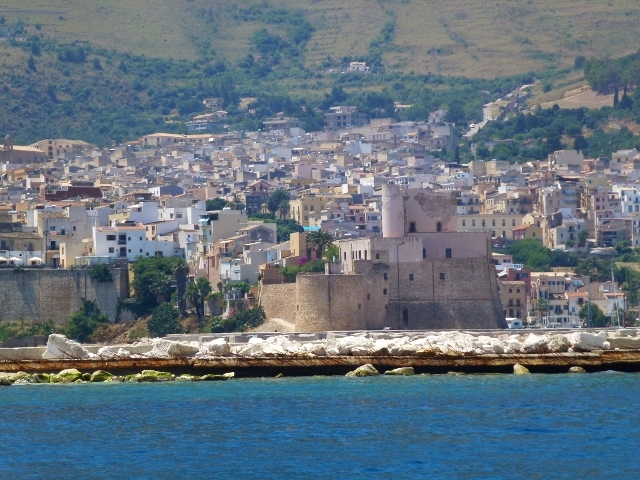 The Castello is a Pisan fortress up above the Marina district and it has several gates and two towers. Towers mean stairs which also means stunning views from the outdoor cafes looking onto the whole city. 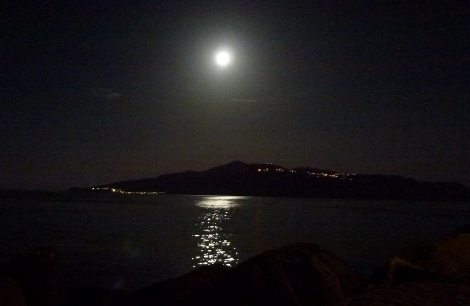 In the east of town is a beautiful and busy beach called Poetto. It was absolutely alive with teenagers, all being seen on the beach. Nearby, are the salt marshes, which are home to the graceful flamingoes that fly over the city just before sunset each day. Two days in Cagliari were spent on boat maintenance, which means we will have to visit again to visit the Flamingos and the wineries. We have a certain number of ‘Euro Days’ – we only have 90 days to spend in the Euro Zone every six months. While we wanted to visit a bit more of Cagliari, we have to be out of of the EU by the end of July. This informs our decisions about how long we can stay on each island or in each port, so that we get to Corfu and out before our time is up. Luckily at this stage, Croatia hasn’t signed the agreement so after our ‘Euro Days’ are up, we can spend several months in Croatia and also hope to see Montenegro. We had a very light wind with calm seas on our passage to Sicily from Sardinia. It was warm enough to camp in the cockpit and we both stood watch while the other cat napped. It was very serene and then suddenly we had a small pod of dolphins come and travel with us for about 20 minutes, but this was the comedy troupe. These young dolphins were doing belly flops, side flops and surfing the bow wave with great enthusiasm. They loved our applause and seemed quite happy to pose for photographs. In Osti Antica, dolphins were an oft repeated mural in the warehouses and shops. 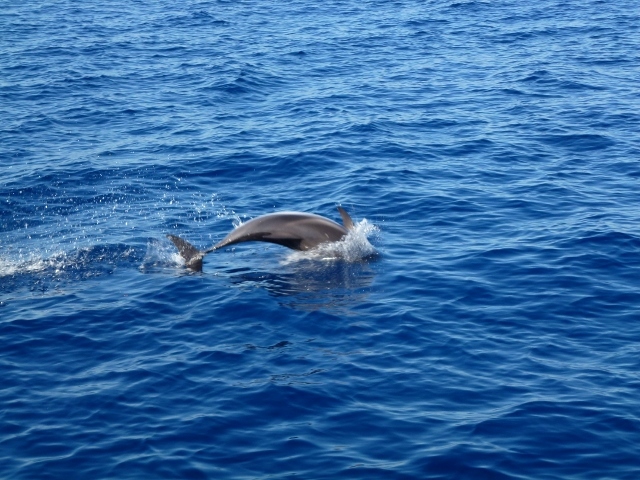 Dolphins were very popular with the sailors in ancient Rome and now. 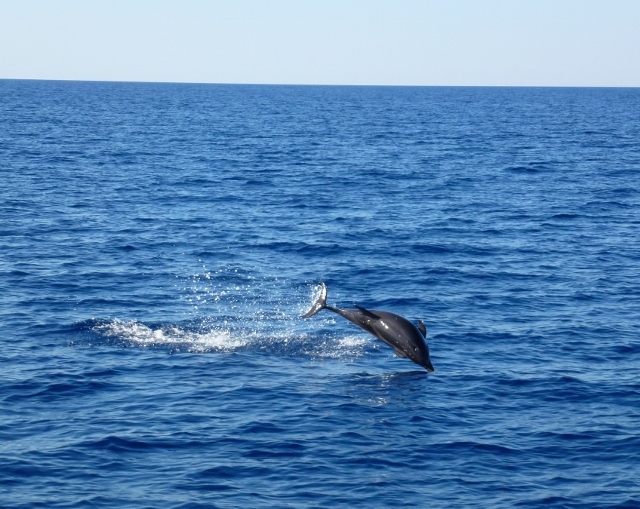 A pod of dolphins visiting brings an infusion of enthusiasm and laughter and we were both energised by their gymnastics and happy spirit. 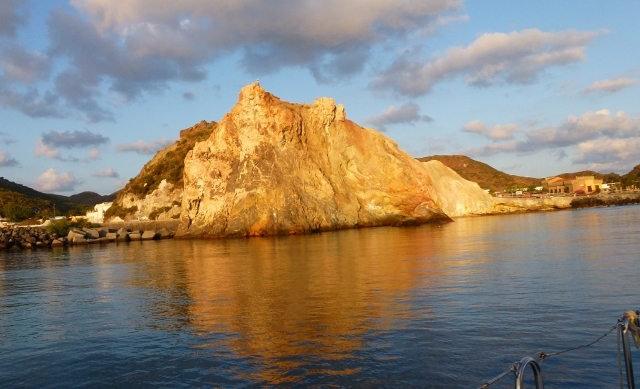 Our next port is Favignana or Odysseus’s Goat Island in the Isole Aegadi group. We look out into the distance and think we can see them rising out of the mists. We have had a few days to miss the Swannos & our very fun travel with them on Mercier. We had excellent weather and saw some wonderful ports. 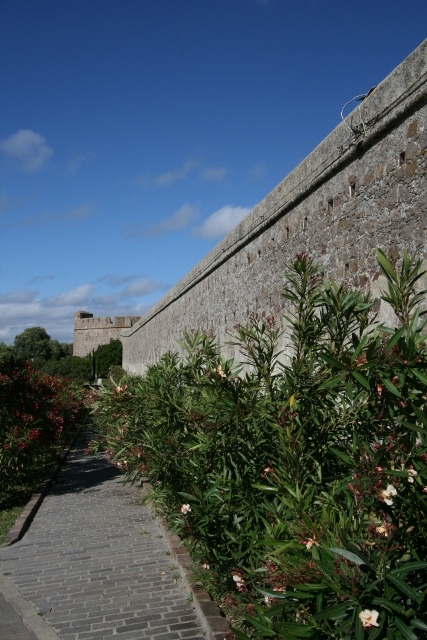 As soon as they left the sky went gray, so we took ourselves for a walk on the Bastione or sea wall of Alghero. That night we went to a wonderful restaurant, Ristorante O with Irish Masterchef E. O’Neill. 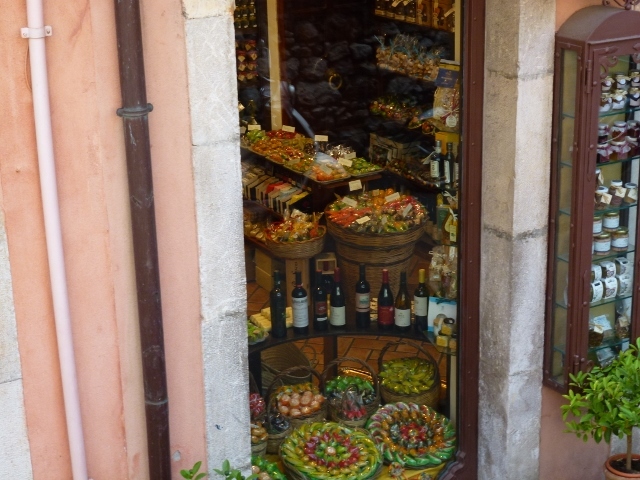 There are so many great restaurants in Alghero, nice clothing shops too. Happy Birthday ( a bit late) to Richard and to my baby sister Linda, who had a wonderful 50th birthday on the 6th. Gai is on the 11th, Colin is going to have a wonderful birthday on June 12th, Happy birthday! Susan B is the 16th, Rowena is the 17th – know you two will be spoiled by your sweet husbands. Our nephew Mike too, Happy Birthday. We wish you all a very happy birthday. We also spent a few hours trying to work with “Follow me” until we found our blog is not set for follow me,sorry it isn’t working and we will try again. Early the next day, we woke up and found it was an early departure because the breeze freshens in the afternoon. Next port of call is Carloforte which is quite a nice town, with a salt marsh and flamingos. 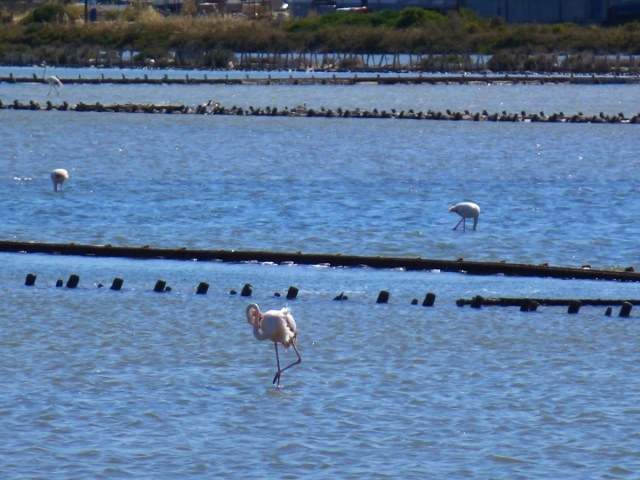 It seems there are several reserves for flamingos in South Western Sardinia. We found a gelaterie and we walked all around the town. In our marina, there was a very nice little cafe, and they had lovely couches, great music and Aperol spritzers. 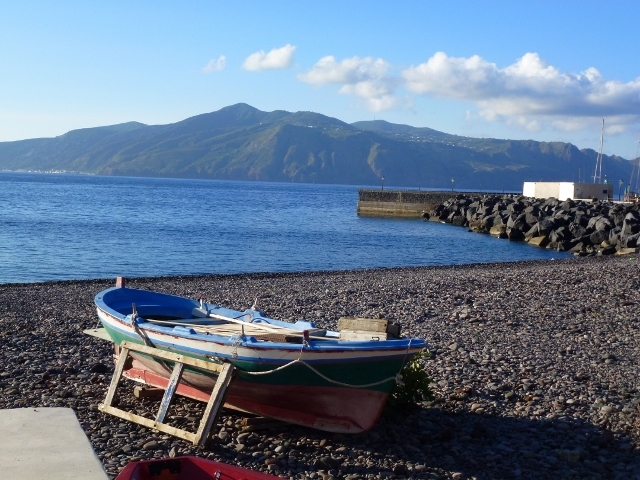 We left early again this morning and arrived in a mistral at Porto Teulada, there is a town about 8 kilometres away and we were very happy to get to the marina before the wind, possibly a mistral came by. 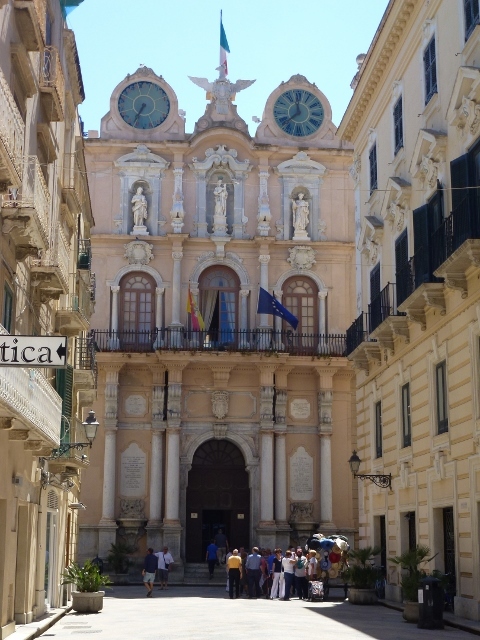 With any luck, we will leave early to be in Cagliari, because Teulada is perfectly quiet for one day but two days wouldn’t be nearly as fun. 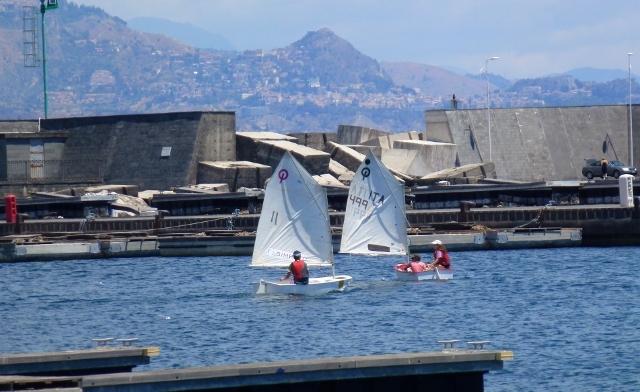 In the Med, although we are on a sailboat, we are often motor sailing. Usually because there isn’t enough wind, there is too much wind or the wind is coming from where you are going, otherwise known as Rules of the Med. Thursday’s sail from Castelsardo to Stintino, was a ripper. The sun was shining and we departed the marina. We were saying goodbye to the Citadel and the breeze filled in to the NE. This was very reminiscent of an old fashioned Sydney North Easter. James and Donald had the spinnaker out ‘tout suite’. Swanno was on the bow feeding the spinnaker out of the bag, Sue and I were in the pit and we were pulling it up. Suddenly, we see Swanno lurch, then the spinnaker pulling him over the side of the boat. 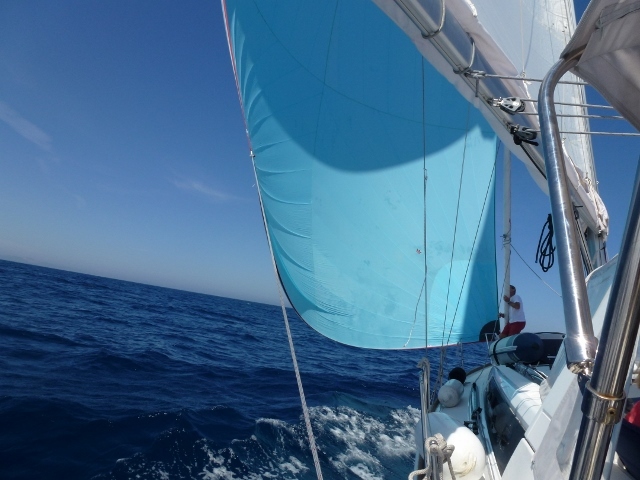 He pulled himself and the spinnaker back in – sigh of relief from the pit and the captain. Swanno’s balance tested and he won gold. 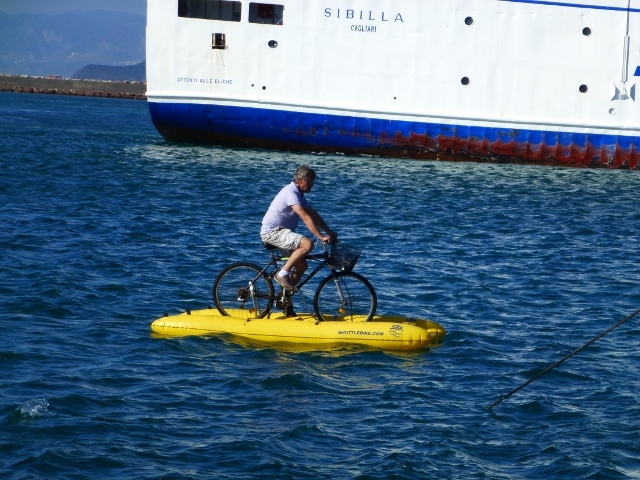 Very happy not to have a man overboard exercise in Sardinia. 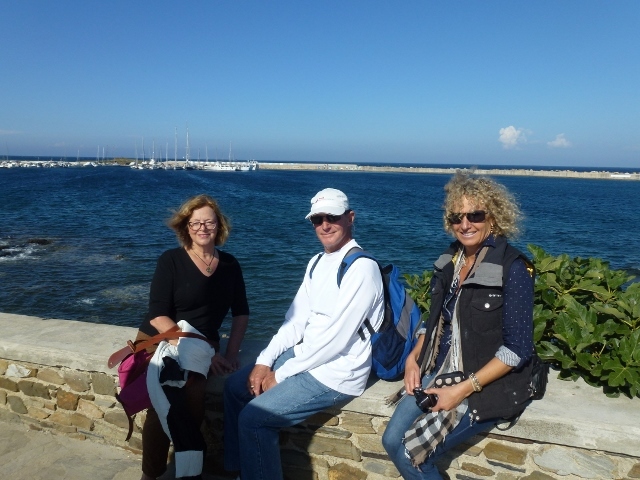 We arrived at Stintino, a small fishing village and went for a small walk around the marinas and through the town. We had a lovely dinner as we listened to the church bells ring out Ave Maria. We left very early the next morning, in very light winds and motored through the Fornelli Straits. The water was like glass and you could look down 3 metres and see weed and sea cucumbers through the aqua water. The water was crystal clear, the sky was blue, the sun was out. On the passage, dolphins came and said hello and then continued on their way. But there were more surprises ahead. Sighting Capo Caccia, a marine reserve one hour west of Alghero, we are surprised at how tall and how beautiful this majestic limestone promontory is . 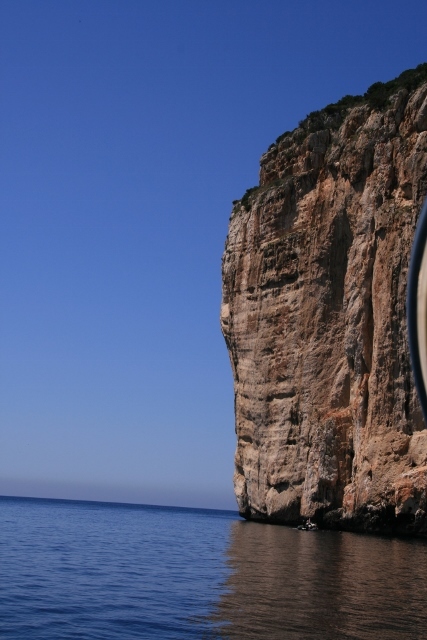 Capo Caccia is a striking vision as you approach it from the sea. We slowed to look at an excursion boat seemingly stuck in a cave entrance. 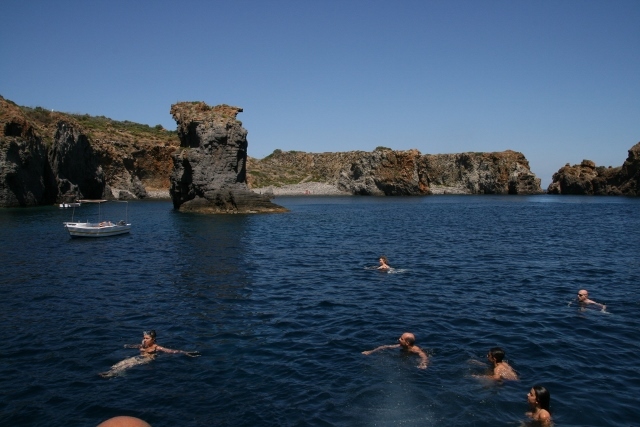 Then rounded this 186 metre towering headland and found the sun shining, azure waters and the water was 20.3C. The water was warming up, so we stopped the boat and most of the crew had a magnificent swim. In the cliffs, there were small holes that the wind had created. We saw pigeons flying in and out. We could also view swallows, large gulls and a peregrine falcon. A fleet of kayakers came by in their red kayaks and yellow vests gliding right next to the dive boat where everyone was dressed in black. 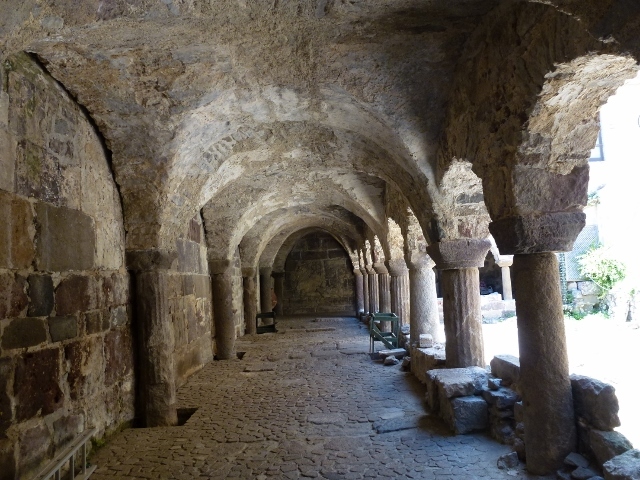 Eventually it was time to head into the fortress city of Alghero, and a wander through the old fortress, the markets and of course the hunt for the wonderful gelato. Tonight is Sue and Swannos last night and we have a wonderful meal and then back to Mercier to celebrate the 150 miles we have sailed together over the past week. It has been so much fun. Same time next year?